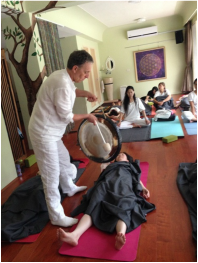 The entire body vibrates and changes as the gong is played. In our body there are 72,000 nerves that send energy throughout our bodies to shape us physically, emotionally and mentally. Specific areas of the body and mind are stimulated by the vibration waves of the gong. The sound of the gong projects to all of the chakras (energy centres) and can be used as a powerful instrument to open and balance them. Certain areas of the gong relate to different chakras. When these areas are played the chakras become more responsive and therefore opened and balanced. The gong helps the chakras to coordinate and move more freely. For example, the sound waves can stimulate the glandular system to a higher level of functioning because the vibration causes all of the cells of the body to move and to release blockages. With sensitivity you can feel this in your body when you listen to the gong. gives a sense of expanded awareness and higher consciousness! What we discovered was a remarkable healing transformation took place affecting the Red and White blood Cells, T- Cells and Platelettes. Sherry observed the Blood terrain opening up enhancing the flow of Oxygen & Nutrients, Red Blood Cells were less congested and the energy potential of the cell increased, the Immune System was incredibly stimulated and White Blood Cells were much more active, larger, brighter & inflammation indicators decreased. Also the amount of damaged Cells from possible parasitical damage decreased from 70% down to around 30%. All of this from just Sacred Sound.